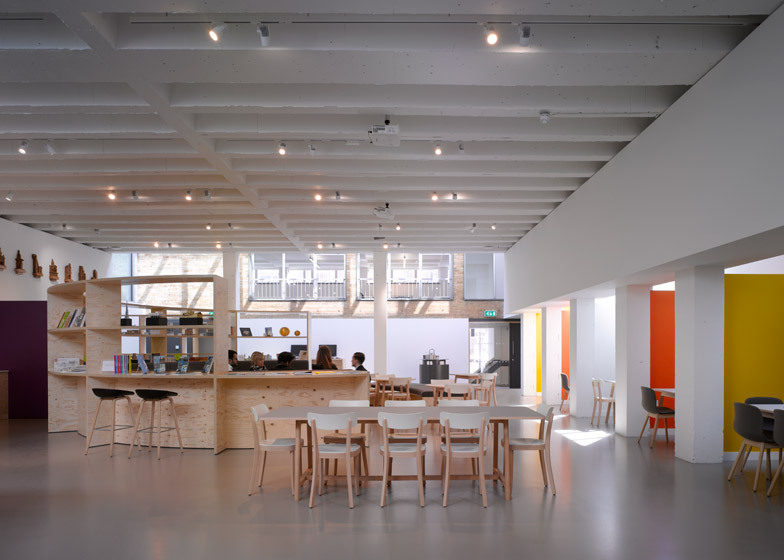 London studio Theis + Khan has completed the new headquarters for the Royal Institute of British Architects, featuring a bright and spacious cafe space and custom-made plywood furnishings (+ slideshow). The new RIBA HQ is located at 76 Portland Place, a few doors down from the organisation's historic base at number 66. 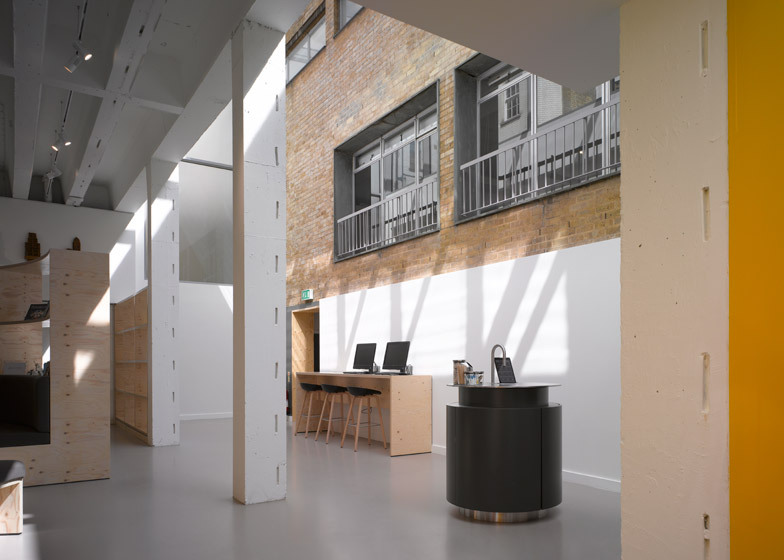 It brings together all of the architecture institute's London staff under one roof, freeing up the old building for exhibitions and events. Architects Patrick Theis and Soraya Khan conceived the building as a "younger sibling" to its more traditional neighbour – an Art Deco structure built in the 1930s. 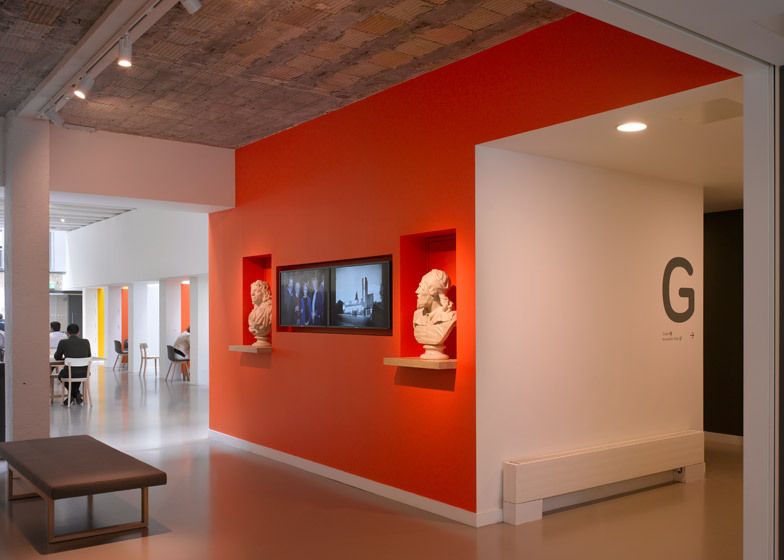 They introduced vibrant colours, more temporary materials and plenty of natural light. "It was an exhilarating and often challenging project with a tight budget and timescale that dictated a pragmatic approach to ensure money was directed to what mattered," explained Khan. "Simple, robust materials and sensitive detailing of found and new surfaces left what comes free – careful planning, natural light, colour and well-proportioned spaces – to bring delight." The building is made up of three structures. The street-facing section is a seven-storey office building dating back to the 1950s. 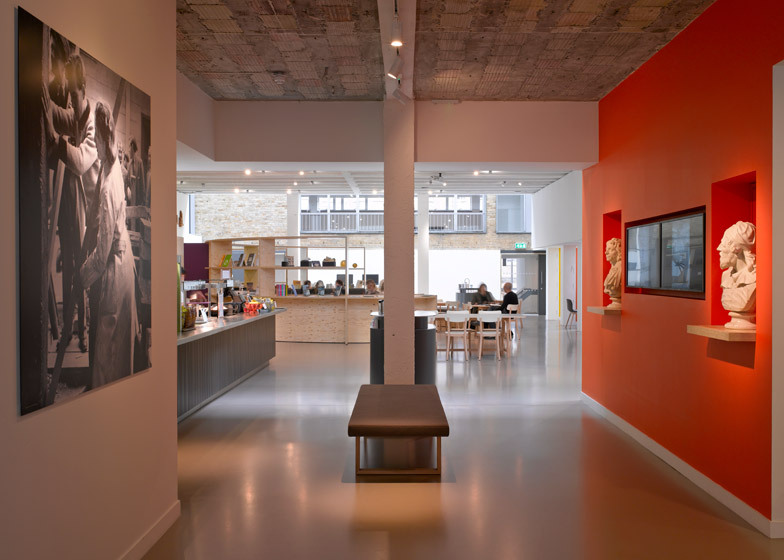 Behind it, a three-storey converted mews stands to the back of the open-plan cafe space, known as the forum. The original facade was opened up with a wall of floor-to-ceiling glazing, making the forum visible from outside the building. 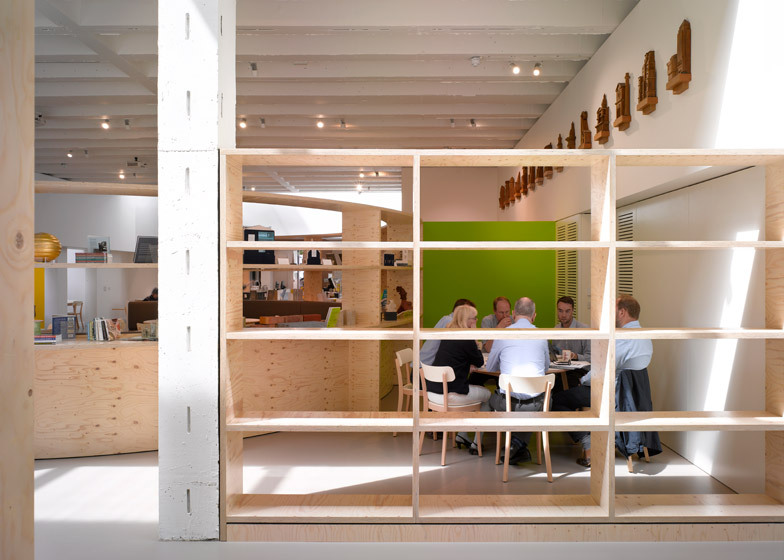 Once inside, occupants are led past a plywood-lined reception desk towards the space, which functions as both a canteen, a co-working spot and an informal meeting area for RIBA staff and members. 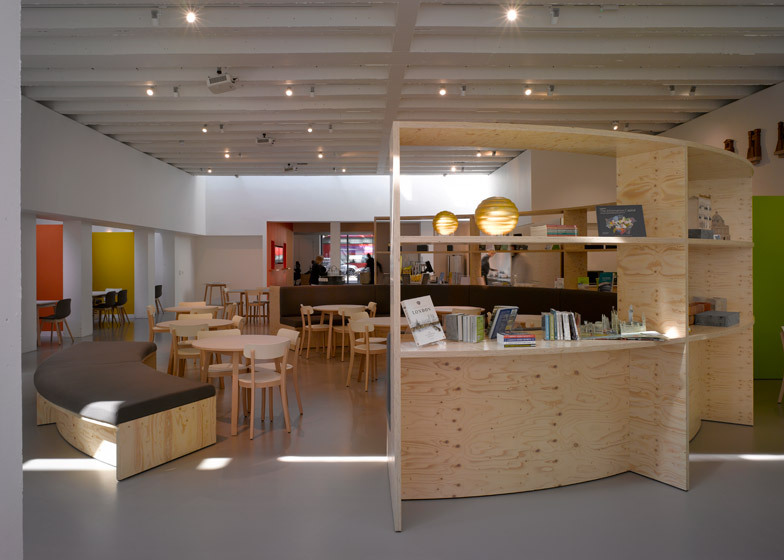 It features banquette seating booths in shades of yellow and orange, dedicated computer stations, plus freestanding plywood display stands that house both books and architectural models. Alongside the cafe counter, there also are two iPad-controlled stations where visitors can help themselves to a drink. At the rear of the space, a triple-storey glazed atrium allows natural light to permeate the room, as well as providing a framed view of 66 Portland Place. "Office design is being revolutionised through rapidly evolving working patterns, shaped by technology," explained Theis and Khan. "Our design approach at 76 Portland Place has been to create a sustainable and flexible working environment within the confines of the existing 1950s building, that has a strong and contemporary identity of its own yet relates to the heritage of 66 Portland Place," they added. 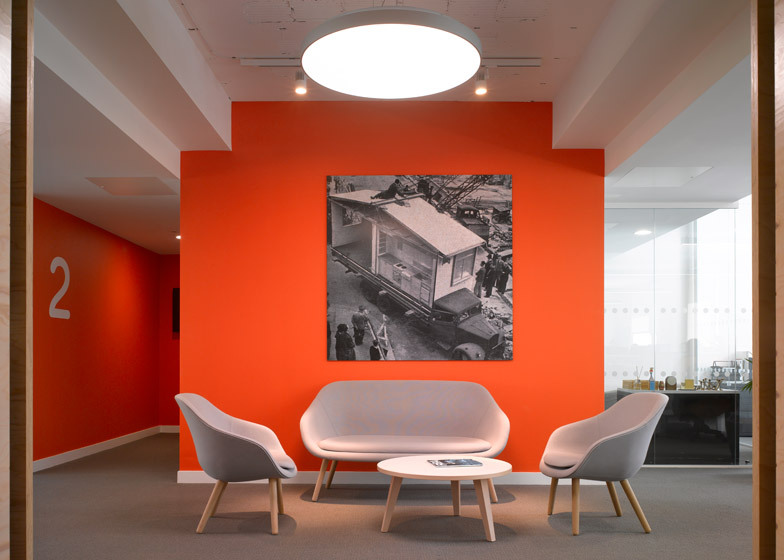 "The fluidity of this new working environment is in direct contrast to the formality of the current headquarters building, an exciting juxtaposition embodying the RIBA's past, current and future thinking." Bright colours were added on the walls of the upstairs landings, helping people to easily navigate the building and giving an identity to different departments. There are also various artworks, photographs and sculptures from the RIBA's archive dotted throughout the interior. A large meeting space stands at the building's entrance, while more private meeting rooms and other quiet spaces can be found on the uppermost floor. With over 40,000 members, the RIBA is an organisation established to champion the work of British architects. London architect George Grey Wornum designed its 66 Portland Place headquarters following a competition in 1929, but the RIBA later outgrew the building and had to relocate some of its staff elsewhere. 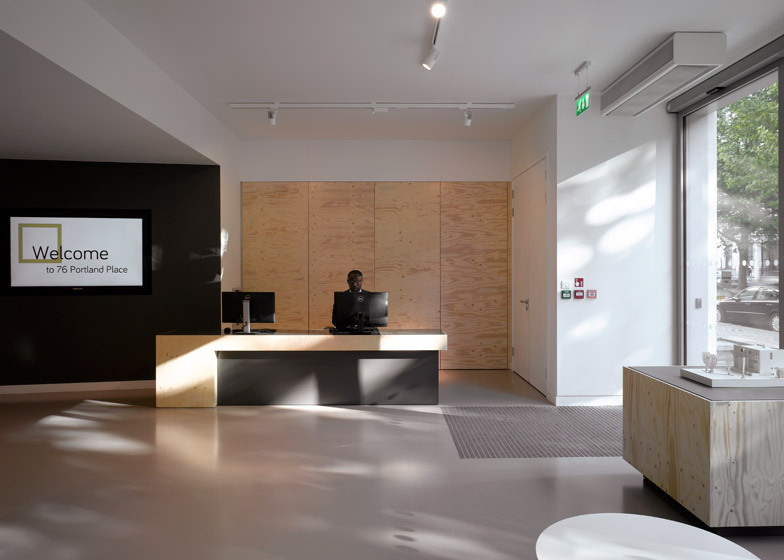 The new building brings staff from RIBA and RIBA Enterprises back together, while the mews offices at the rear function as an incubator space for RIBA London members. London studio Carmody Groarke is now renovating 66 Portland Place, creating new visitor spaces including a dedicated architecture gallery.